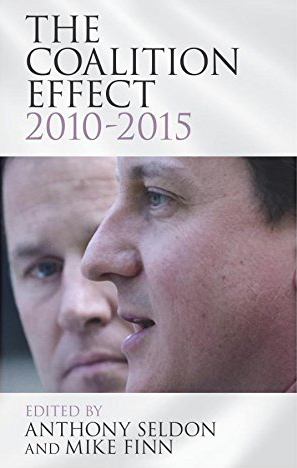 In The Coalition Effect 2010-2015, Anthony Seldon and Mike Finn have collected a volume of essays examining the impact of the Coalition government of 2010-2015 on British politics. While the hindsight enabled by the 2015 general election result and Brexit means the precise legacies of the Coalition are still unfolding, this is an indispensable text that provides intriguing, expert assessments of ‘the Coalition effect’ across all major policy areas, finds Jim McConalogue. The Coalition Effect, 2010-2015. Anthony Seldon & Mike Finn (eds). Cambridge University Press. 2015. Ahead of the 2015 General Election, Anthony Seldon wrote a clear introduction to this expert volume of essays, setting out the observation that David Cameron’s place in history was already secured: for holding the coalition itself together; significantly improving the economic outlook; overseeing some steady domestic reform; restoring dignity to the PM’s office; and winning the Scottish referendum (25). To those, further cementing Cameron’s place in history, we might now add the 2016 referendum on Britain’s EU membership. Yet, our judgement of the former PM will rest a great deal on the broader question of how history will judge the Coalition government. For a book that asks much more rigorous and specific questions, this volume, edited by Seldon and Mike Finn, helpfully comes very close to looking at that verdict. The Coalition Effect, 2010-2015 deserves serious recognition for setting out, and in many respects crystallising, the major and contemporary distinctive effects of the Coalition government on British politics. Its Herculean task is carefully pursued through 23 chapters of sober, analytically rigorous and critically evidenced observations which adhere to the final conclusions of Finn – that although Britain’s first peacetime Coalition government since the 1930s came into existence because of political necessity, this neither prevented it from setting high ambitions for itself nor inhibited its capacity to generate legislative, economic, governmental and political effects (601). This account and assessment of the ambitions, the visions and the ‘new politics’, including the Programme for Government, tell us much about the Coalition in terms of its history, its meaning and desirability. For Finn, the Coalition was successful in some economic ambitions – notably, restoring the economy to growth (in terms of jobs and employment) – but that it failed in other significant areas e.g. eliminating the structural deficit, government borrowing and its position towards the ‘cost of living crisis’. It did not achieve its economic targets. As Paul Johnson and Daniel Chandler’s chapter on the Coalition and the economy expresses, the 2010-2015 government only endured Act One of a two-part process of fiscal consolidation in which Act Two may well have been tougher, albeit only now just unfolding (193). Finn further concludes that the Big Society ‘failed emphatically as a unifying ideal’. And what is also notable about memorable figures such as Andrew Lansley, who ‘went rogue’, and Michael Gove in ‘carrying forward his personal agenda’, are their solo, independent and real effects – but that means they were not truly ‘Coalition effects’. The Coalition’s huge impact on the NHS and education was divisive. Furthermore, for all the debate, the government did not achieve much on constitutional reform. The relationship with Europe deteriorated significantly. It advocated intervention over Iraq and Libya, but could not carry the Commons or the country over Syria. Some of the most devastating Coalition effects were not on agendas as such, but on the Conservative and Liberal Democrat parties. And England, of course, still does not love coalitions. Finn’s observations also raise issues particularly germane to the 2015 General Election: that an unintended net Coalition effect is the genuine emergence of four-party politics at Westminster (at that stage envisaged as being Conservatives, Labour, Liberal Democrats and UKIP). The real ‘fourth party’ was, of course, the Scottish National Party (SNP), returning 56 MPs at that election. Yet, as a chapter by Neil McGarvey highlights, beyond Westminster, coalition and multi-party politics, fixed term parliaments and referenda were not truly novel since they had already become part of ‘normal’ politics in Northern Ireland, Scotland and Wales (110). While four-party politics could still potentially have far-reaching implications for Britain at home and abroad, as Finn argues, one is left with the niggling question of whether such an emergence could just as easily be viewed as a consequence arising from, for example, an absence of catch-all, cohesive and strong leadership within mainstream parties in a rapidly changing environment rather than stemming from a peculiar ‘Coalition effect’ as such. Peter Riddell, citing Robert Hazell, describes the essence of the broader problem in his own chapter that all the authors of this volume face: ‘It is important to try to distinguish what is a necessary consequence of coalition government and what is merely contingent’ (130). This volume, then, is a significant move towards identifying those distinctions and features from necessary but seismic fudges and the intricate but often unforeseeable complexities and promises-turned-compromises of coalition government. Martin Loughlin and Cal Viney’s chapter on the Coalition and the constitution is supremely notable for its consideration of fixed term parliaments, voting and House of Lords reform, sovereignty and the EU, rights protection and Scotland and Wales in the UK. It is well justified in concluding that ‘the experience of the 2010-2015 coalition government highlights the dangers of a minority party [the Liberal Democrats] seeking to use its leverage to bring about basic constitutional reform on matters for which there is no cross party consensus’ (86). There is one proviso, however. The implicit division and tension of parliamentary and popular government, theorised by Vernon Bogdanor and which Loughlin and Viney adopt, does not explain precisely how coalitions preclude democratic government and principles. Most importantly, Parliament as a whole (as well as the electorate) did not endorse by any kind of mandate the Coalition arrangements, which in turn endorsed the Coalition Agreement. Their view, therefore, that the implication of the formation of coalitions between the parties is that Parliament, rather than the electorate, has the decisive role in determining who will form the government (84) is problematic in this case – neither Parliament as a whole nor the electorate directly endorsed the Coalition arrangement preceding the Agreement. It seems more likely that the Coalition of 2010, as organised by a very small clique of political elites (probable ministers and senior party figures), required the bypassing of Westminster and the Coalition agreements, precluding formal democratic procedure and parliamentary government founded on accountability to the electorate. The Coalition Agreement itself was not a Westminster phenomenon, but a Whitehall one. As Seldon writes in his introductory essay, ‘the advice from Whitehall officials was that the national interest demanded stable government’ (2): thus, the Coalition was born. It is for this reason that Loughlin and Viney’s chapter provides and provokes a stimulating essay and debate on the key principles of coalition government. There is also sometimes a point of caution, or perhaps reservation, towards supposing multi-party coalition arrangements are themselves a ‘Coalition effect’. Anthony King in The British Constitution (2007), for example, considered a line of argument that briefly came to the fore during the turbulent 1970s when adversarial politics and the extremism of party political rides on the ‘ideological big-dipper’ occurred, alleged to have led to economic stagnation, political chaos and a society at odds with itself (270). As a result, some began to see the solution as Proportional Representation and the essential formation of moderate, anti-extremist, inter-party, coalition governments. It bears some political resonance with the UK’s post-2008 wave of economic recession followed by tighter post-2010, Conservative-led, governmental austerity measures; it is possibly too soon for political analysts and scientists to predict again only a long future of coalition governments. The wonderful hindsight of the 2015 general election following the publication of this volume showed us that a wafer-thin majority Conservative government could be capably formed while coalition arrangements are rapidly, but with dignity, consigned to history. Yet, if anything, the indispensability of this text lies in the fact that five years after the first coalition government was formed since the Second World War, a wide variety of esteemed experts from Whitehall, Parliament, academia and think tanks have given their professional and intriguing assessments of the ‘Coalition effect’ across all major policy areas. Jim McConalogue is a doctoral student pursuing a PhD at The Open University, examining UK parliamentary sovereignty in relation to European Union membership.